"Daly City: Then & Now" author event, August 6th at Florey's! 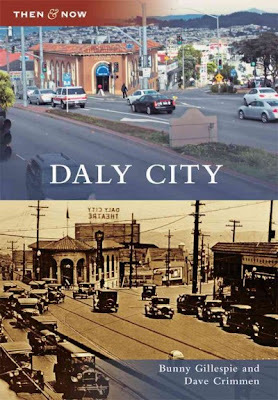 Florey's Book Co. welcomes local authors Bunny Gillespie and Dave Crimmen as they discuss their new book, "Daly City: Then & Now". A haven for refugees after San Francisco’s devastating 1906 earthquake and fire, Daly City incorporated in 1911 with a population of 2,000. With more than 100,000 residents, it is now the largest city in San Mateo County. Adjacent to San Francisco, the Golden Gate, and San Francisco Bay, Daly City has been “The Gateway to the Peninsula” for over 150 years. For this book, Daly City historians Bunny Gillespie and Dave Crimmen worked with the collections of the Daly City/Colma History Guild and private parties to present vintage and contemporary views of this diverse municipality. 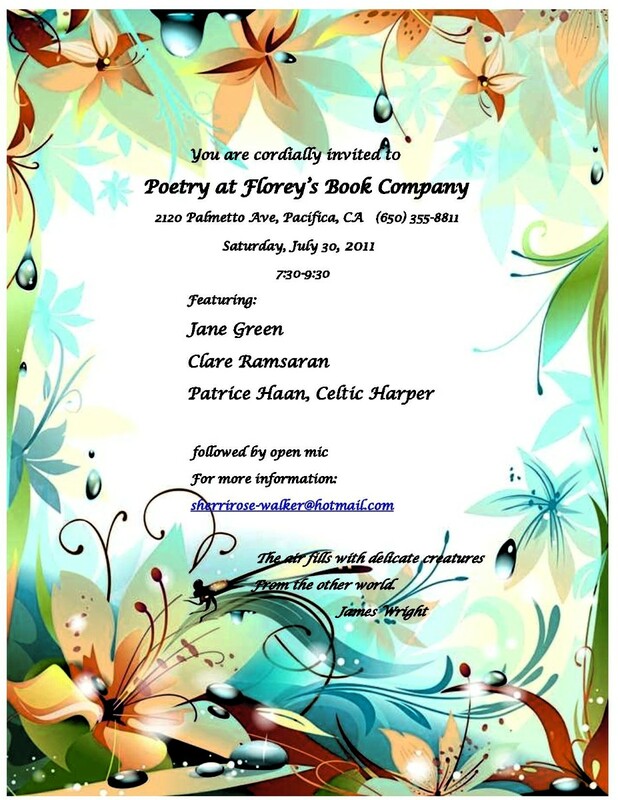 Poetry in July at Florey's! The featured poets this month are: Jane Green, and Clare Ramsaran. There will be a special appearance by Celtic harper Patrice Haan as well. The featured poets will be followed by an open mic period. Open mic sign-up is first come, first served. This event is also open to the public and free of charge. 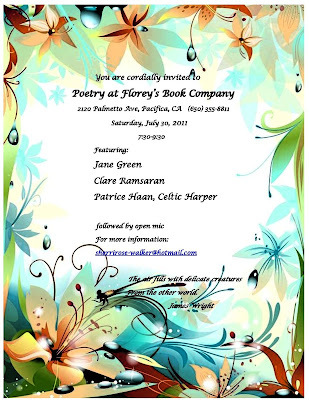 "Pescadero Creek" author event July 16th at Florey's! Florey's Book Co. welcomes author Victoria Williams-Fisher as she discusses her new novel, "Pescadero Creek". 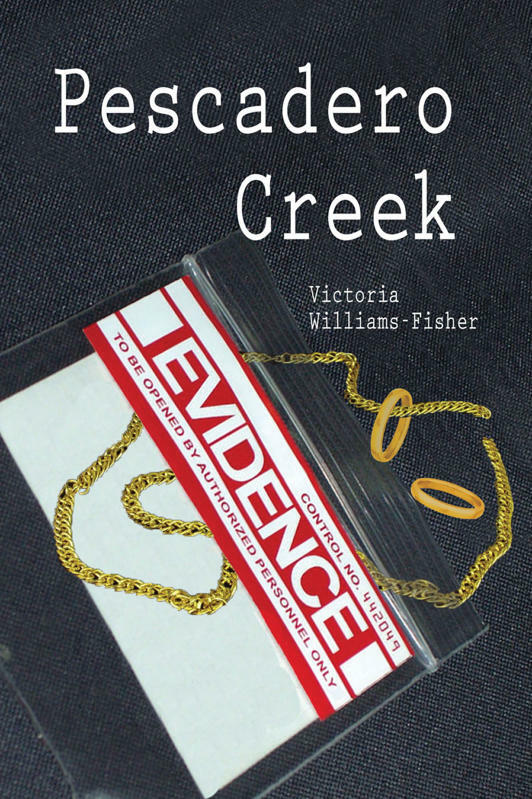 Victoria Williams-Fisher is a new novelist now living in Tennessee. will soon be followed by "Undercover" and a third in the series, "Remembering".